I’ve committed to donating at least 10% of my matched betting* profits to charity by the end of the year. So far, I have donated a total of £460. In the scheme of things, it’s a tiny amount, but it’s still a few hundred quid which I could be chucking towards my own savings and investments (or holidays!) and it’s more than I’ve ever donated in the past. One of my goals this year was to ‘twin’ my toilet with a block of toilets at a school via Toilet Twinning for a £240 donation and I have now achieved my goal (this amount is included in the above £460 figure). We are far from living in the dark ages yet there are still millions of people around the world today who are not able to ‘do their business’ in a sanitary and safe toilet. Imagine having to worry about your own health and safety every time you wanted to go? Stressing about whether there’s any toilet paper seems so trivial in comparison! 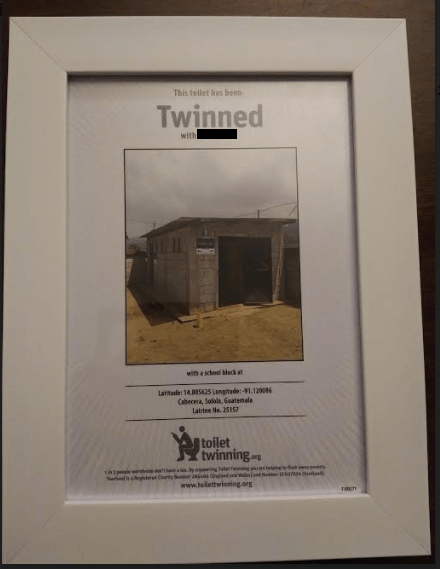 Some might think this framed photo is an extravagance on the charity’s part, but Toilet Twinning first came to my attention when I saw a similar framed photo in the toilet of some pub. Perhaps guests to my house might be intrigued enough with the photo to find out more about the charity. I intend to continue to support this cause so will aim to twin another toilet block next year (to the other toilet in the house!). According to the website, it’s possible to twin someone else’s toilet, so perhaps in the future, I’ll twin a ‘lucky’ reader’s loo, if there’s any interest for that sort of thing, haha! Other charities I’ve been supporting on a regular basis are Age UK, Macmillan Cancer Support and British Red Cross as well as adhoc charities (eg sponsoring friends and colleagues). I’ll probably add one or two more to this list as time goes on. This entry was posted in charity, matched betting by weenie. Bookmark the permalink. I donated half my December profits to Gamcare last year – taking value from bookies and giving it to a charity to help problem gamblers appealed to me. I think I might follow your lead this year. Cheers Borris and good choice on your chosen charity – I’ll add that to my list of charities to donate to. Interesting charity, Weenie and definitely something that can make a huge difference. It may be a tiny amount in the scheme of things, but in the scheme of an individual I think it is a very large amount! I buy our toilet paper and tissues from a company (with an excellent name) that donates 50% of profits to building toilets in the developing world. Sounds like your toilet paper company has a similar initiative and I agree, this is something which can make a huge difference. Also in terms of improving health and sanitation, this should lead to less money required to treat sickness as a result of poor sanitation etc. I take the view that if we are able to live in a first world country, be able to work and earn a living that affords a decent home, then giving money to less fortunate people or causes, is the right thing to do. Sounds a bit po faced put like that, but we are lucky and we shouldn’t forget it. I have a few regular donations, usual collections and a rule that says if recieve an unexpected windfall (I received a small inheritance this year), then 10% goes to charity. I didn’t have it, so i don’t miss it, is the reasoning. Thanks Jane and well done on your own 10% rule. I do consider myself lucky and felt that donating to charity would mean that my financial journey wouldn’t just be about me getting more wealthy and not helping others a little along the way. When I no longer need to work full-time, I may consider donating my time. If I find that volunteering isn’t for me, then I’ll just continue to donate money. Hope they have decent WiFi/4G or some old fashioned newspapers for your grateful twin-poopers in Guatemala… Nice idea! I’ve personally donated some of my profits towards a horse charity for ex-race horses. Congrats on hitting the donation and helping build the loo! I have to say I think it’s a great idea, and kudos to the pub who kicked off the idea! I’ve not really done as much as I could/should this year for charity but my regular donations continue…! Are you going to let us know how many people see the sign and also then also go on to follow suit as it were! Cheers FiL – a shame I don’t recall the pub where I saw that picture, otherwise I could have given them a shout out! Haha, if any of my friends do sign up as a result of seeing the framed pic, then yes, I’ll be sure to mention it here! Haha Rob – yes, it is kinda different yet just as important as other charities. Congrats on achieving this charity donation goal, and a very worthy cause. I’m going to think about adding this to my list for next year.